Philips unveils its first 2012 TV range | What Hi-Fi? 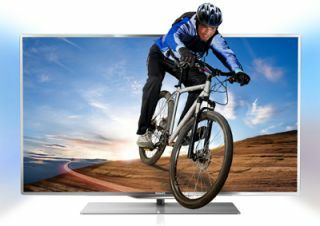 Philips has launched its 2012 TV line-up with five new ranges that are set to go on sale in Q2 of this year. The five series cover the budget to midrange of the market, with new sets in the 3000, 3500, 4000, 6000 and 7000 model ranges. There are passive and active 3D sets, TVs with Smart internet content and DLNA functionality and screen sizes from 19in to 55in. Kicking things off is the 3000 series. Available in 32, 37, 42 and 47in sizes, they're full HD sets, with 100Hz processing, three HDMI inputs and a USB connection. They're the only non-LED LCD models here. Next is the 3500 series of LCD/LED sets, available in the widest range of screen sizes on offer from Philips: 19, 22, 24, 32, 37 and 42in. It's the entry-level option if you demand Smart TV and DLNA functionality, and it's also wireless with the optional USB dongle. On to the 4000 series and the main additions are Pixel Plus HD processing and 200Hz motion processing. They're internet-connected sets and are available in 32, 37, 42 and 47in sizes. It's a big step up for the 6000 series, which is the first to incorporate Philips' Ambilight technology and support 3D. The sets are passive 3D – or Easy 3D, as Philips calls it – and also sports integrated WiFi plus voice and video calls via Skype. This series is available in 32, 37, 42, 47 and 55in sizes. Last but quite the opposite of least is the Philips 7000 TV series. The range is available in a choice of 40, 46 and 55in sizes, adds Pixel Precise HD processing, 800Hz Perfect Motion Rate and crucially active shutter 3D, or 3D Max as Philips knows it. All the 3D sets also allow two player full screen gaming for 2D games, using Philips 3D glasses to cleverly allow each player to see a full screen image in two player mode, which is a neat feature. Due out in Q2, we've no more info than that as yet, we await information on prices.